(http://www.bbc.co.uk/news/world-latin-america-12159943) format created by the BBC. 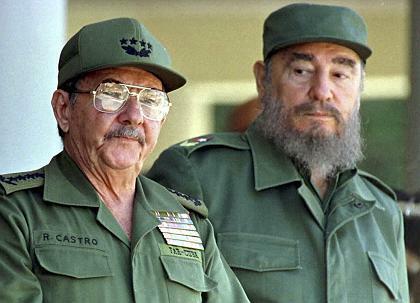 In February 2008, Fidel officially resigned from his post after transferring his political powers to his brother Raul due to health issues. Many people wondered if this change of leaders would improve relations between the United States and Cuba, but as of now the tension between the countries hasn’t seemed to have relaxed much since the Cuban communist revolution in the 1950’s. Currently, the United States’ official policy towards Cuba centers around two strategies: economic embargo and diplomatic isolation. Under the George W. Bush administration, the embargo was strictly enforced and travel restrictions were very high. Now, under Barack Obama’s government, travel restrictions have been lifted as of April 13th, 2009, and although the embargo still remains intact, as of 2000 the Congress has elected to allow agricultural exports from the US to Cuba. Although Obama is much more lenient on Cuban restrictions, Cuban politicians and citizens are much less optimistic about the formation of a positive and progressive relationship between the countries. According to the Miami Herald (http://www.miamiherald.com/2011/09/28/2430033/us-cuba-seek-improved-relations.html), US President Barack Obama is hopeful for the future of US relations with Cuba, but nothing can be done until Cuba is willing to negotiate specific political points as well as respect human rights. It seems unlikely relations will improve while the Castro brothers are still in power, as they have been known to publicly criticize and insult the United States and President Obama in particular, but the United States hopes to one day repair the relationship between the two nations.